In the manufacture of measuring instruments for pressure measurement, WIKA already has over 60 years experience. We apply our extensive know-how, daily, to the development of our pressure measuring instruments. This force can result from a liquid, from gases or vapours. The International System of Units uses the unit of measure Pascal (Pa) for pressure. In European markets, pressure measurement is generally carried out in 'bar' as a unit, in American markets in 'psi' (to the unit converter). Absolute pressure: Pressure relative to the reference pressure zero (in air-free space). Differential pressure: Difference between two pressures, p1 and p2. Here, the differential pressure p12 is either generated from the pressure element or calculated. 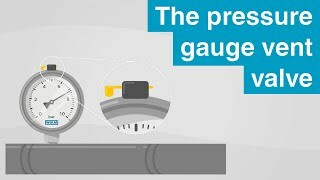 Overpressure/gauge pressure: Pressure relative to the atmospheric pressure (ambient pressure). 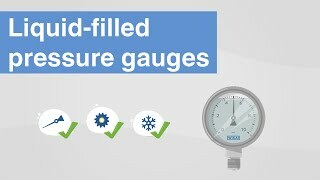 WIKA offers various types of instruments for mechanical pressure measurement: Pressure gauges with capsule element, diaphragm element or Bourdon tube. With the mechanical pressure measurement with resilient pressure elements, no power supply is required. The pressure enters the pressure chamber of the measuring element, of which one or more of the walls deforms elastically in proportion to the pressure. This deformation is thus the measure for the pressure. Since the deflection achieved with this is in the range of a few tenths of a millimetre up to 10 millimetres, this deflection is converted into an angle of rotation through a movement. The pressure is read directly off an appropriately divided scale via a pointer. For electronic pressure measurement a sensor is required to detect the pressure and/or its change, and to convert it accurately and repeatably into an electrical signal utilising a physical operating principle. The electrical signal is then a measure of the magnitude of the applied pressure or change in pressure... The instruments for electronic pressure measurement feature excellent dynamic properties and a low material stress, which expresses itself in a high load cycle stability and long-term stability. Measuring instruments for electronic pressure measurement can also be made available in very small sizes, e.g. through the use of semiconductor materials.